The Infinity Green Chargers are the most energy efficient industrial battery chargers on the market. They were developed from the ground up to eliminate wasted energy, materials, and battery life. 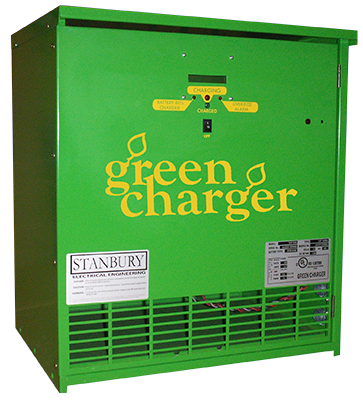 Stanbury chargers consistently outperform the competition in independent tests of energy efficiency. With over 20 years experience in building high-frequency battery chargers for industrial applications, nobody in the industry can match our functionality, quality, reliability or ability to effective support high-frequency chargers. (H x W x D) Weight Lbs.